10 Baht type 1 with the title "promise to pay"
10 Baht type 2 the title was change to "banknote is legal tender"
Type 1 ordinary number signature Supayok UNC about 20,100 - 21,100 baht. Type 1 ordinary number signature Supayok VF about 10,400 - 10,900 baht. Type 2 ordinary number signature Mano VF about 5,900 - 6,200 baht. Type 2 ordinary number signature Supayok F about 2,400 - 2,500 baht. Type 2 ordinary number signature Komarakul UNC about 43,700 - 45,800 baht. Type 2 ordinary number signature Komarakul EF about 20,700 - 21,700 baht. Type 2 ordinary number signature Mano UNC about 39,000 - 41,000 baht. Type 2 ordinary number signature Mano G about 5,900 - 6,2000 baht. Type 1 lucky number 00001 signature Supayok VF about 29,500 - 31,000 baht. The price was updated on 24th December 2017. His Royal Highness Crown Prince Vachirawut ascended the throne to become the 6th monarch of the Chakri Dynasty on 11th November 1910. In early of the reign, the 1st series banknotes had been still circulated. The government intended to change the form of banknotes and seek the company to print. Thomas de la Rue finally won the bid and was assigned to print the 2nd series banknotes. This was the first series of Thai banknotes to bear an image due to counterfeiting. But there was not watermark in the paper. 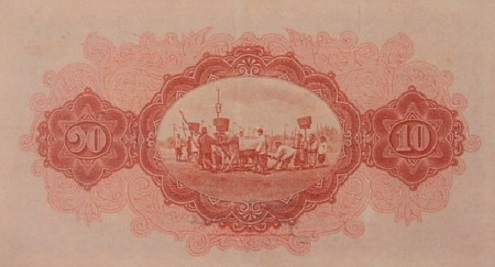 King Rama 6 considered that picture of the Royal Ploughing Ceremony was appropriate to appear on a banknote because the ceremony representing an important part of the Thai culture. 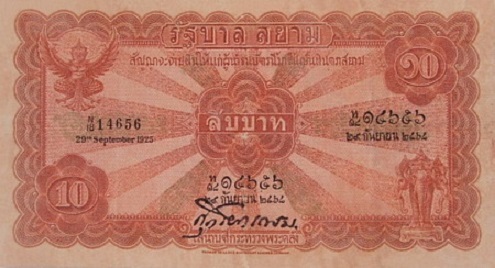 At the beginning the 10 baht banknotes were print with the title "Promise to pay to bearer on request in Siamese currency" that comply to the current currency act. Then the Temporary Currency Act was announced in 1918 to cancel the right to pay. Until the Currency Act in 1928, it was specified that country's money consisted of banknotes and coins. So the type 2 banknotes were changed the title to "The banknote is legal tender in accordance with the law". 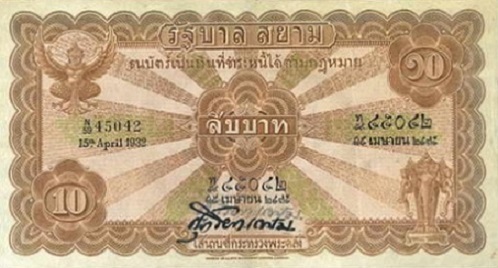 The 2nd series 10 Baht type 1 banknotes were announced on 18th Febrauary 1925. The 2nd series 10 Baht type 2 banknotes were announced on 19th Febrauary 1928. The face value banner is on guilloche design with twelve blue rays each of which was made up of the microprinted text Government of Siam written in Thai. The Roman alphabet and Arabic serial number is at upper left and the Thai alphabets and Thai serial numbers is at upper right and lower middle with their own banknote dates. The main object is the Royal Ploughing Ceromony in the center with the value expressed in Thai and Arabic numerals placed on a guilloche design.